WHY ARE WHITETAIL DEER SUCH A PEST? There are many species of deer in the United States including elk, moose, mule and reindeer. And though this article will focus on the whitetail, the products listed will work on all of them. 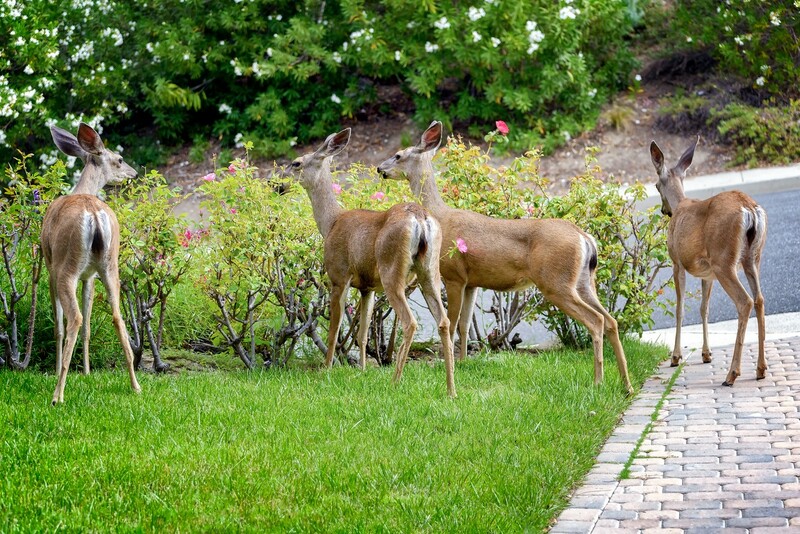 Whitetail deer present a problem when they start to browse on your grass, shrubs and garden. 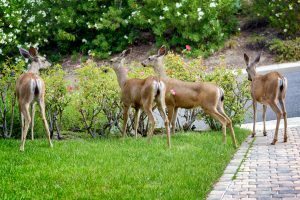 They will eat most anything including all types of browse (leaves, stems and buds of woody plants) as well as flowers, grain, fruit, vegetables and just about anything a homeowner might plant around the yard. Deer eat a lot; the average adult male can consume over 5 lbs of food a day. We have 3 whitetail deer repellents which can keep deer off your property. These are all unique in how they work but when applied properly, whitetail deer will avoid the areas they protect. The first option is bad tasting agent. Highly concentrated and safe to spray on any non-edible plant, DEER OFF is a proven repellent to ward off whitetail, moose, elk and mule deer. It’s concentrated and when mixed with water, treated plants will become “bad” tasting so foraging animals like deer or rabbit will avoid the protected plants. Gallons will make 8 finished gallons of spray and coverage is about 1600 sq/ft of shrubs 4 feet tall or 3,000 sq/ft of flat turf like grass (per finished gallon). This means you’ll get about 12,800 sq/ft of protection for shrubs with an average height of 4 feet; 24,000 sq/ft of protection of flat turf like grass from 1 gallon of concentrate. 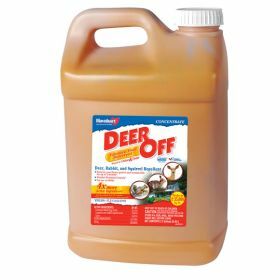 To create a mixed spray, add 4 oz of Deer Off to 28 oz of water to make a quart of spray; 16 oz of Deer Off to 112 oz of water to make a gallon of spray. 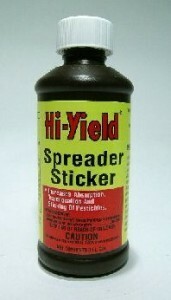 To help the Deer Off cover all parts of the plants you treat, add SPREADER STICKER to the tank mix. Spreader Sticker is a “surfactant” and basically helps to “spread” the water and chemical over the surfaces your treating. Many plants have waxy, oily foliage making it hard for any kind of treatment to “stick” well but with some Spreader Sticker in the tank with the Deer Off and you’ll enhance the overall performance of the treatment significantly. Add 1 oz of Spreader Sticker per gallon of mixed Deer Off. TO INSURE YOU GET THE BEST RESULTS AND TO MINIMIZE THE RISK OF PLANT BURN, TREAT WITH DEER OFF AND SPREADER STICKER IN THE EVENING JUST BEFORE DARK. Remember, you don’t want to spray fruit or vegetable yielding buds that will be harvested. The bad taste will linger for many weeks and will probably make the harvest useless. You may spray the plant stems, stalks and leaves as the plant develops without the taste getting to the fruit. 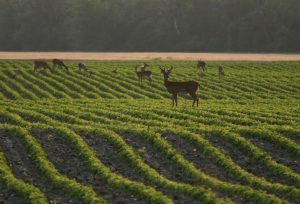 This could prove a big help when dealing with deer that like to eat young plants that haven’t produced any crop yet. Be sure to treat these to insure they can. 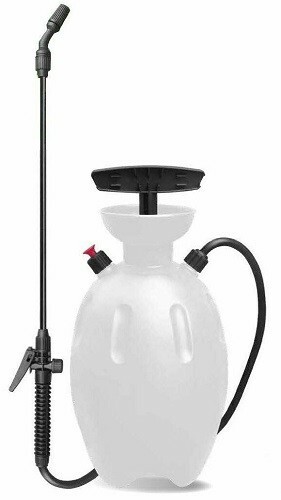 To apply the Deer Off mixture, use any standard PUMP SPRAYER. Another way to repel moose, elk, whitetail and mule deer is to install our MOTION ACTIVATED WATER SPRAYERS. It uses nothing but water to chase animals and can be quite effective when trying to protect small areas from foraging wildlife like whitetail deer. Each unit has a built in motion detector that is powered by a 9 volt battery. 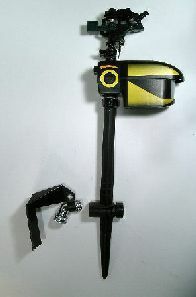 You can adjust it to “see” up to 35 feet away but can be adjusted to a smaller zone if needed. Once motion is detected, it will release a 3 second blast of water. The unit will then shut off and reset within 10 seconds. It will then be ready to spray again. Units have a stake bottom which allow you to set it into the ground securely and can be linked by a single hose so you can set up several in “series”. This will allow a progressive coverage zone if needed. We have two sound repellers which will keep whitetail deer, moose, elk and mule deer of your property. Once is well suited for urban areas with yards 1 acre or less. The other is best suited for 5+ acres like farms. Lastly, one of the easiest ways to keep deer from entering your yard is to install SOUND REPELLERS along property borders. By default, these units emit an ultra sound deer do not like. You can also set them to release an audible sound for an extra “scare” impact. For open areas, it will protect up to 5,000 sq/ft. Like a flashlight, the sound will project in the direction the unit is pointed so its best to line your property borders by installing them within 30 feet of known entry points. Our unit can be set to operate at night, day or both. For deer, you’ll generally want to set it for “night”. Next, you’ll want it to activate when it senses motion so set this switch to “motion”. Below this setting is the sensitivity setting for the motion detector. In general, you’ll want this set all the way up to “30”. This means it will turn on when animals are within 30 feet of the unit although it could off when they’re within 40 feet depending on visibility. Next, you’ll want to set the audible sound as high as you can. In general, 60-80 is high enough. Keep in mind this sound is loud so if you plan on placing the unit close to a neighbor, you may need to keep the sound volume down. By default, the LED Light Bar will go off automatically as will the Ultra Sound. Lastly, turn the yellow button frequency setting almost all the way to the left so the dial is pointed at the word “Deer”. 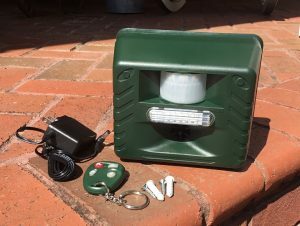 You’ll also need 4 “C” cell batteries to power it; the unit will turn on when the target animal walks into the motion detector range and will sound for 20 seconds. During this time the porcupine will leave and after 1-2 experiences with this machine, learn to stay away. Batteries will last 3-6 months if not longer. 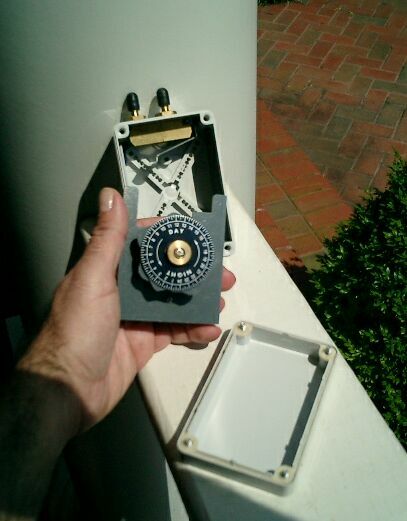 Also included is an optional AC power supply and a remote control so you can disarm the unit anytime. When set to “night”, it will only go off after dark so you will not hear it during the day. But at night, if you wanted to walk within the range of the unit, use the wireless remote to disarm it so you can walk around it without setting it off. Plan on keeping the unit about 2-3 feet off the ground though it can be just 1 foot high or up to 4 feet up. But for deer, 3 feet is ideal. 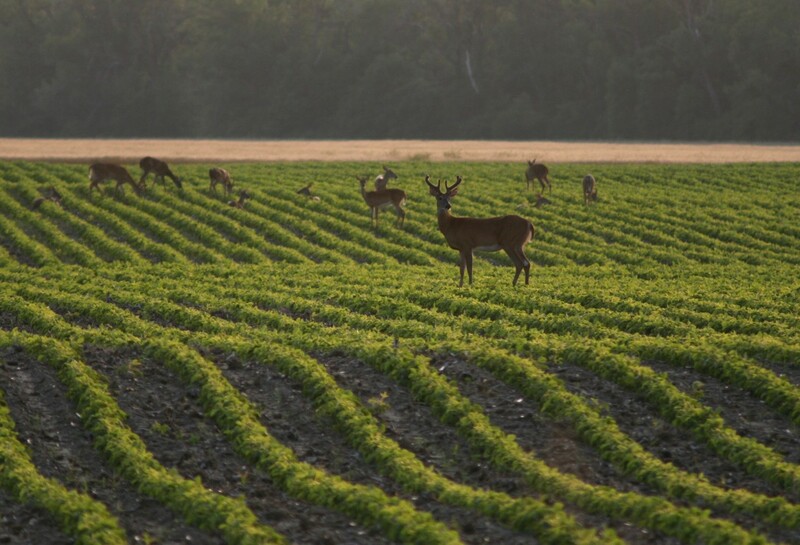 Since deer tend to target one area at a time, it usually only takes one machine to keep them away. But they will adapt so if you have other plants you want to protect, install as many units as are needed to blanket the yard with protection. For really persistent whitetail deer active in an acre or more of land, consider installing an ANIMAL CANNON. This loud “sonic” boom of a sound is enough to spook any deer and they won’t get used to it. Small yet powerful, this device uses propane to power itself and doesn’t need much maintenance. Basically you hook up a standard barbecue propane tank to the unit and when it fills with pressure, the sound blast will release. The time between sounds can range from a few minutes to 10 or more when the tank gets low and the pressure drops. Tanks can last several months so it will not cost much to power one for a year. Just set it up and point it in the direction you want protected and turn it on. Blasts will keep the area free of whitetail deer, moose, elk and mule deer as long as the unit is functioning and running. 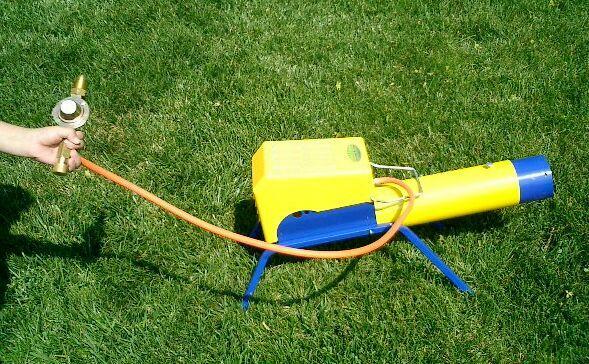 This device is not recommended for the average neighborhood but its wells suited for rural areas. When placed on the ground, this device will cover 2-3 acres if not more. When elevated above ground vegetation, up to 5 acres can be be effectively protected. 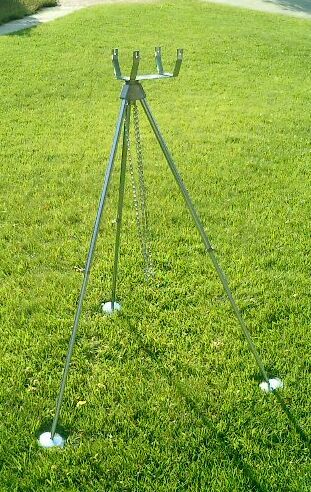 The TRIPOD will allow you to easily keep the unit 5 feet up and its fully adjustable. If you want the unit to only sound at night or only during the day, get a CANNON TIMER. This device will let you set a “range” of when the unit is on or off. It will be a 12 hour window, like 8 PM till 8 AM, so you can have it sounding when the deer are most active.